What links Shakespeare, composer John Cage and actor Leslie Nielsen? What, for that matter, do robots, tape loops, and the invention of the micro dress have in common? Still scratching the old cranium? How about this: A connection between electric tonalities, Anne Francis, and monsters from the unconscious mind. Loosely based on The Tempest, Shakespeare’s final masterpiece, the 1956 science fiction film Forbidden Planet was groundbreaking at the time and remains a worldwide cult favourite. Starring clean-cut hero Leslie Nielsen and a brooding Walter Pidgeon in the Prospero role, there is both mythic grandeur and fantastic imagination at play in this classic. Disclosure: I’m potty about this film, thanks to the Bard. Primed by falling in love with The Tempest at uni and having had the thrill of seeing it performed in Stratford-Upon-Avon, I’ve also watched film versions (one by Peter Greenaway, another with Helen Mirren as the sorcerer) and periodically re-read parts of the script. But, callow pop-culture tart that I am, it is Forbidden Planet that I return to most often for comfort and enjoyment. There is something quintessentially 50s about Forbidden Planet. From the flying saucer-shaped spacecraft to the quaint imaginings of communication technology, the look of the film is a delicious time capsule that hugely rewards those who can see past the clunky effects and painted landscapes. Without giving too much away, the story involves a team from Earth lead by Commander John Adams (Nielsen) travelling to the distant planet Altair IV to investigate the status of an exploratory mission from whom nothing has been heard in a worryingly long time. (Note the similarity of plot line with Solaris). Even as they enter orbit, Doctor Morbius (Pidgeon) warns off the visitors, saying that they are at risk if they land. Morbius reluctantly reveals that he and his delightfully innocent daughter Altaira (Francis) are the only living survivors of the original expedition, making Adams determined to discover more of their story. And there certainly is a lot more story to discover, including an extremely versatile robot, sixty gallons of moonshine, wonders of the ancient Krell, learning how to kiss, and revenge killings by an invisible monster. Throughout it all beats the alien electronic pulse of Bebe and Louis Barron’s unique soundtrack. Having been gifted a rare German tape recorder as a wedding present (beats a dinner set, eh? ), the Barrons had been exploring recording and editing techniques before their move to Greenwich Village in New York, where they met John Cage. The composer employed the couple to work on his ‘Williams mix’ project, which involved splicing together tiny fragments from 600 recordings to make a four-minute collage. Mind-boggling though it might be to contemplate from our digital vantage point, the editing work took Louis and Bebe an entire year. But being confined to an editing suite did have its compensations, as Bebe recalls. Although Cage himself was uncomplimentary about the final result, others were in no doubt this music was something unprecedented and special. Other than fleeting appearances by the theremin in several films (including a couple by Alfred Hitchcock), no-one had previously made an entirely electronic soundtrack. Critics and cinema go-ers loved it. Composers and avant-garde artists also loved it. The musicians union, however, were deeply suspicious of this new-fangled sound-making technology and denied Louis and Bebe membership. They even demanded that the film (and album) credit be changed from ‘Electronic music by Louis and Bebe Baron’ to ‘Electric tonalities’, thus precluding them from any Oscar appearance. It’s a shame, as the Barrons’ did no further film work and one cannot help wondering whether the exposure and acknowledgement afforded by a showing at the famous film awards might have nudged them towards more electronic composition for film. 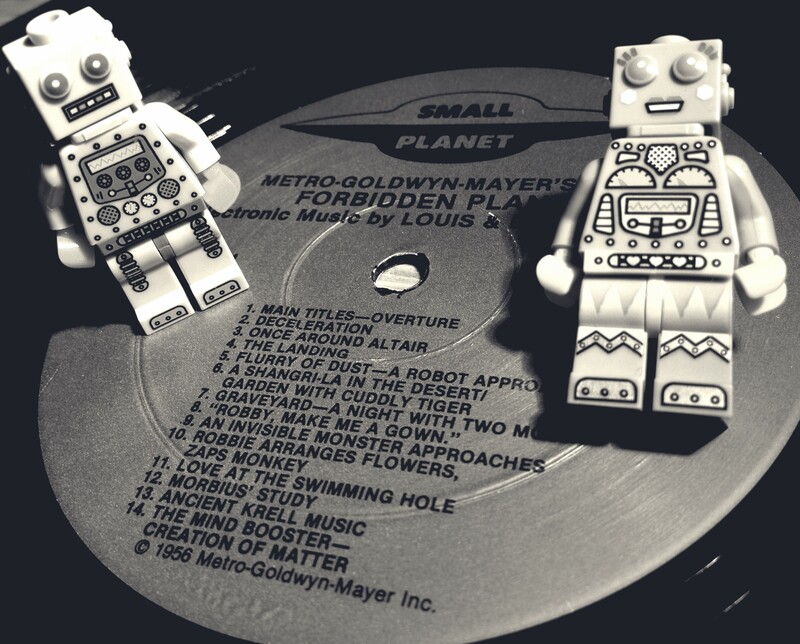 Still, we have the Forbidden Planet soundtrack, and what a fine thing that is. A pulsing, thrumming, whining soundscape generator, powering across time and space. Like any sixty-year-old, the film is a bit creaky and slow-moving, yet the soundtrack has a striking freshness, an edgy compulsion even. For aficionados of electronic music, it is an essential piece of history. Listen to the main title music here. This sounds cool in a retro kind of way. How awesome would it have been to get a rare German tape recorder as a wedding present. Coolest wedding guest ever. All we got were dishes and stuff. Although attempting to spend a year in a studio working with my wife may well have shortened my life substantially. As in less than a year from the start point. I’m thinking the film would have benefitted with the Leslie Nielsen character from either Airplane or Naked Gun. Disclosure: I only understood 95% of your Disclosure lingo, but I think I got the jist. It won’t surprise you to learn, Boppin’, that the Barrons did ultimately separate. That’s what a year cutting up magnetic tape into tiny bits you stick back together can do to a relationship… cut it up beyond splicing. Bebe was really interesting, though, and not at all bitter. Apparently they still did some project together after the split. Pleased to see some CanCon here. Leslie Neilson was a national treasure. This soundtrack was of course groundbreaking and legendary but I didn’t know it existed as an LP. As far as sci-fi goes, this is one I need to add to my collection. I haven’t seen it in many years and I’m not sure I even remember what it’s about. Mike, the film is charming and really quite wonderful as long as you can get past the 50s effects. I don’t mind 50’s effects. I still think The Day the Earth Stood Still is one of the best sci-fi movies ever made. Even if it’s slightly unrealistic today to expect a flying saucer to be guarded by only like 2 soldiers! Totally with you Bro. Film and ‘tonalities’ work so well together – I just love the Krell power plant – and the vinyl just feels so right! I’m all about the tonalities, myself. I love the film hugely and in context the ST is great, I struggle to make it through a single side of the LP as a listen though. Dang! That was meant to add a picture to my comment, not sure it worked. In a fine example of his individual style, 1537 wrote about Forbidden Planet a couple of years back. Thank you Bruce, you make me blush. Totally love the film but never really gave the music much thought so I’ll need to address that! Well, it is probably unlike any ‘soundtrack’ you’ve ever heard. That may or may not be a good thing of course! Holy crap I need to see this. And I need to hear this. WHERE HAVE I BEEEEEEEN????? The ‘Main Title Theme’ is linked just at the end of the post. That’ll give a pretty good idea of what you’re in for with this album! The soundtrack of Forbidden Planet (courtesy of YouTube) rings the digital equivalent of bells in diverse regions of my brain. I have very vague memories of the film. The Barron’s equipment makes some of the stuff we saw at the Grainger museum a couple weeks back look primitive. But the Forbidden Planet soundtrack is not too far removed from Percy’s Free music No. 1 (for four theremins). I recommend it. (Apparently Grainger saw ‘Forbidden Planet’ several times). Nice one. The quality is pretty average, but this clip gives the idea. Thanks DD. I’ve been Traveling the Spaceways with Sun Ra and his Myth Science Arkestra since your Baron planet post. A nice nudge off my intended course, thanks Bruce. Thanks J. The soundtrack is something of a landmark for electronic music nuts – it’s certainly different! That is a youthful Leslie Nielsen! Sounds promising Bruce, nicely reviewed! Thanks Geoff. It’s a charming film if you like early Sci-Fi. (Or the youthful legs of Anne Francis – no wonder Leslie was smitten). Well then Shirley I’ll have to see it! Just not as an in flight movie, eh? Knew there was Robbie before there was ‘Lost in Space’ but have never seen ‘Forbidden Planet’. Re-reading this reminds me to remedy that soonest. Clunky effects bother me not at all. I actually made my daughter sit through the 1930s Boris Karloff ‘The Mummy’ last week during her too quick visit. I told her it was a requirement; she was in Egypt after all. That’s fabulous. Presumably she knows the Brendan Fraser film already? Be assured that, when you visit these parts, if Forbidden Planet is not already ensconced in your film pantheon, you will be bolted to the couch, forced to imbibe a Coonawarra red, and brainwashed. Dr Morbius has shown me how. In the dark and deathly frightened by the Coonawarra threat, I watched ‘Forbidden Planet’ in HD today. Given the era, I expected cheese but found none. What a great story! Reminded me of beloved scifi short stories I inhaled as a kid. And those gorgeous matte backgrounds! And Anne Francis’ legs! And the soundtrack unlike anything else from that era or otherwise! You may be on to something here, VC. Ya can’t beat good source material, can you? And that chap Bill Shakespeare knew a thing or two about story-telling. Delighted you enjoyed it, Vic, and managed to survive, even without a Aussie red for fortification. Amazing what sticks with us. CB really likes Walter Pidgeon. I revisit it once in a while. I guess it’s time. Hope you enjoy returning to Forbidden Planet. It always makes me feel good! I have a bunch of flicks I revisit periodically. Guys like Pidgeon, Vincent Price, Christopher Lee, Peter Cushing, Donald Pleasence always added to the appeal of these kinds of flicks. These films are treasures for so many reasons. Good post Bruce! We have been recently watching the new ‘Lost In Space’ series on Netflix. Still love the origin series though, but this new reimagined series is terrific. I will have to check out Forbidden Planet. I reckon Forbidden Planet was hugely influential on the original Lost In Space, so I imagine you’d love it, Robert. Especially if you love The Tempest as well!